Get industry standard video editing tools for advanced post production and collaborative workflows. Subscribe here for a new 1-year license. 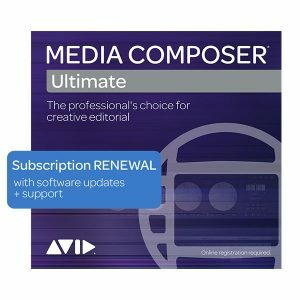 For professional editors, assistants, journalists, producers, moviemakers, educators, and other media contributors who need advanced post production and collaborative workflows, Media Composer | Ultimate (previously Media Composer) provides all the features and functions to facilitate working collaboratively as a team. Please note that all sales on digital products are final. It is the customer’s responsibility to ensure that the system requirements have been met. Please call us if you need further advice.